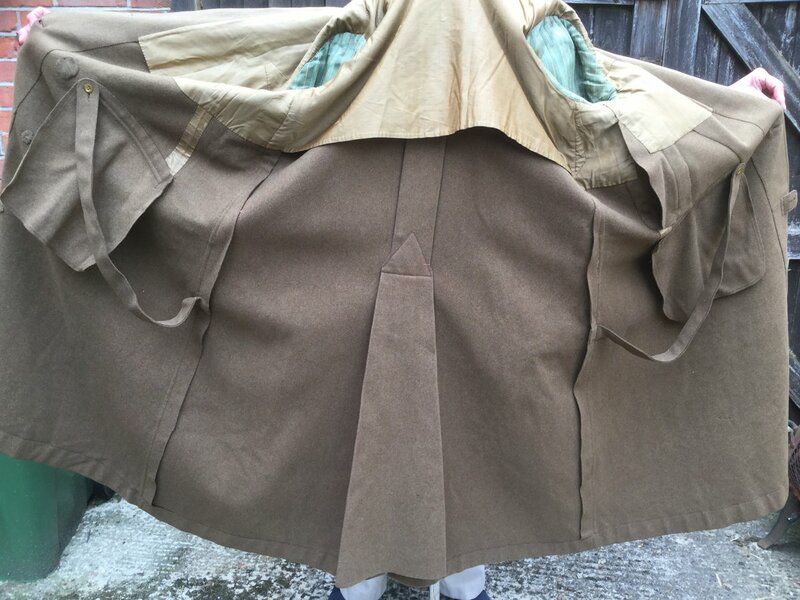 I am having trouble with identifying this greatcoat! I know that in the Great War they were singles breasted, but I have seen some photos with double breasted being worn. This greatcoat was a private purchase to an officer of the RAMC, and unfortunately there are no labels present. However, all the original KC brass buttons are, and the maker is Jennen of London which dates them to pre 1924 when the company folded. 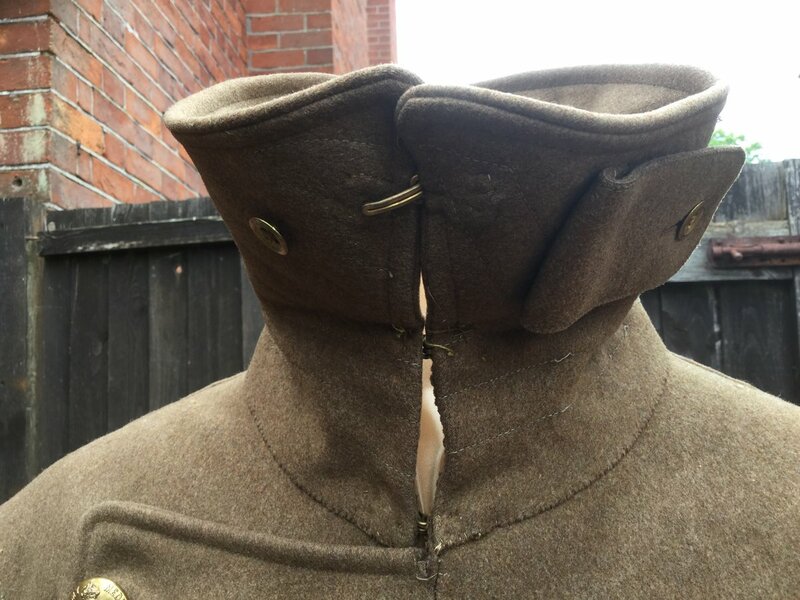 The other baffling things are the collar closures, and the straps on the inside of the coat. I am guessing it was for a mounted officer and the straps went between the legs to keep the coat in place, but I could be wrong! I am also unsure as to whether it is in fact a WW1 item or between the war. I have never seen another Greatcoat like this one. It’s a typical dismounted pattern officers greatcoat, probably from between the wars. Mounted officers greatcoats were ankle length. I think that the straps were either, to facilitate folding into a banderole, or to tie back the fronts when striding out. They might, however, be for securing to the legs when riding, as you have suggested if the officer was of field rank and entitled to a charger. Thanks for the information Frogsmile. In fact the coat is very long. I am 5’10” and it is ankle length on me! There is also a sword vent on the left side. Does that help any more? Not really. Most of the mounted duty officers greatcoats were single breasted with a larger than usual collar and very loose fitting with just a strap at rear to draw it in when dismounted. Swords were fitted to the saddle by WW1 so a side slit was for all officers for use when dismounted, whatever arm of the service they were. Your greatcoat would be long if made for a tall man. They were bespoke and generally cut to mid-calf length, which is still longer than greatcoats today. N.B. Soldiers mounted pattern greatcoats were predominantly double breasted but much shorter and as much used on wheeled transport as four legged. Glad to help, it looks in excellent condition. To a wool moth they are akin to fillet steak so such coats are often damaged with moth nip. It is in great condition, with only a couple of moth trails. A couple of tears on the front and rear flap closure but easily repaired. can I pick your brains on what you said about a “ strap” on the rear? Do you mean a 2 piece strap with three buttons? From years in the saddle as a pony-mad teenager, I had a tough, purpose-made riding mac which had those straps on the inside. You put one round each leg so that, while riding in the rain, the mac did not slip away from your legs and expose them to the wet weather. Yes, the straps were used on all military greatcoats and are not a special feature of mounted or dismounted patterns, even more modern Soviet greatcoats have them. They merely reflect that greatcoats are loosely cut with pleats and folds to facilitate movement and so have to be drawn in to appear smart during routine wear. Exactly what I thought, thanks again for your expertise. Hope to call on your knowledge again! Glad to help. 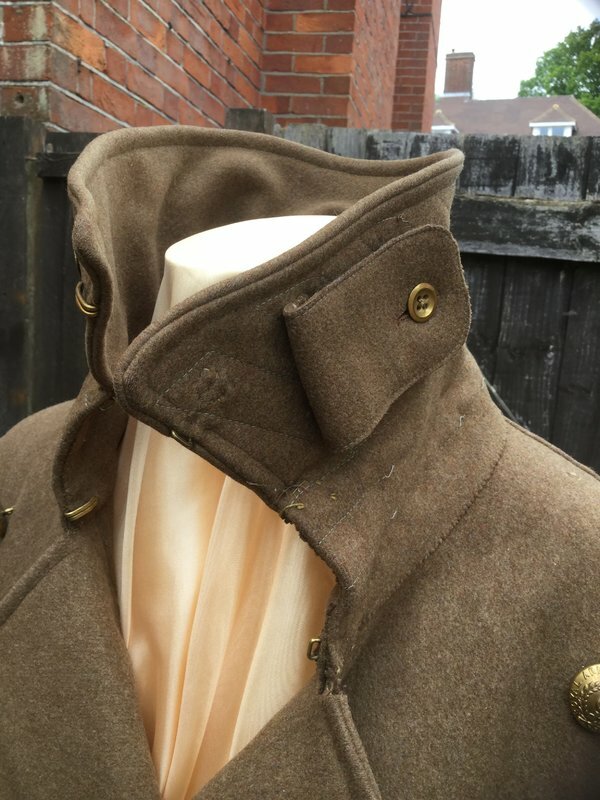 To be crystal clear, my point is not that the greatcoat could not be worn when mounted (it was) but merely that it is of the dismounted pattern and thus by far the most common. 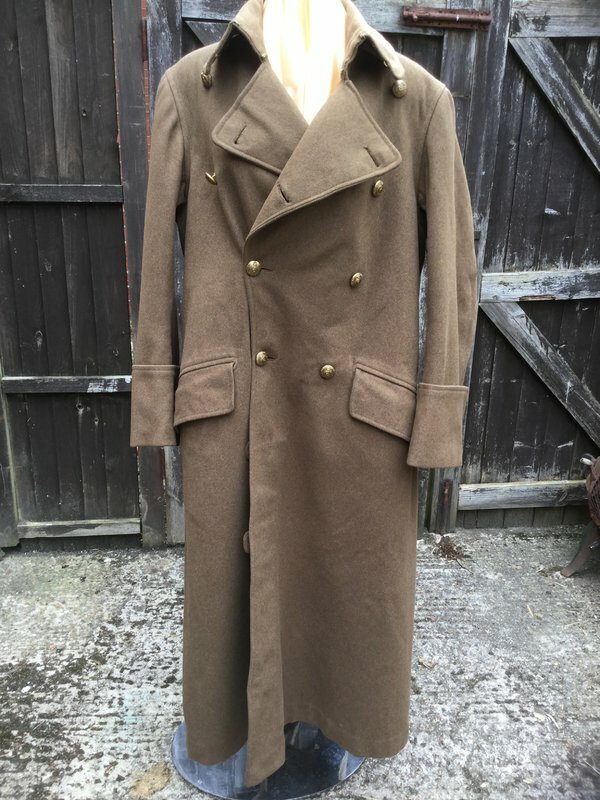 The same coat, in 32oz Melton cloth remained an optional item of dress for officers outfits right into the 1980s, but they had become unfashionable and seen as a legacy of a bygone era, so few but eccentrics ever bought one. The preferred alternative, if anything was worn at all, was a so-called ‘British Warm’ in a taupe colour with leather ‘football’ buttons, which could not be worn on parade with formed bodies, but permitted at all other times. A bespoke greatcoat today (Crombie still make a version) would give you little change from £1,000. Do you know of a decent forum for the second war as I need some help with some items and obviously cannot ask on this forum. Thanks, I have registered with that forum, and sadly not had any response!